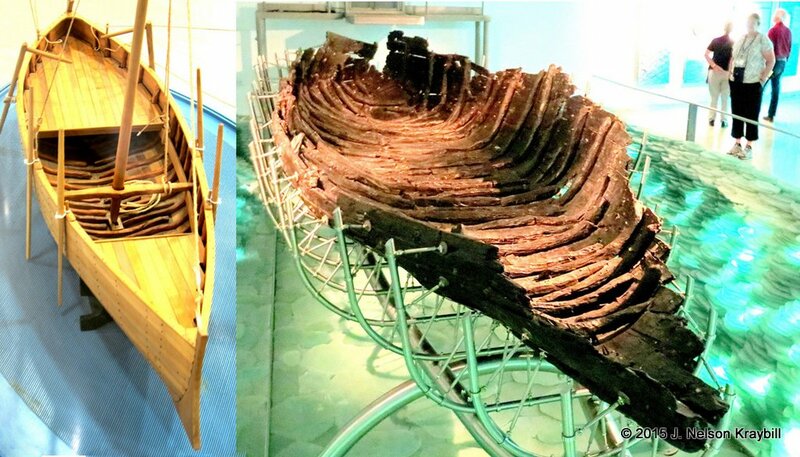 On the left is a scale model of the boat found at Magdala (Migdal), with the bow toward the camera. The actual boat is in the same position, displayed in a museum at Kibbutz Ginosar. Kibbutz Ginosar on the west shore of the sea displays a first century (!) boat about the size the disciples would have used. When drought lowered water to unprecedented levels in 1986, amateur archeologists found a 27-foot fishing vessel submerged and preserved in mudflats off Magdala (also called Migdal), just south of Ginosar. Racing against rising tide, archeologists worked around the clock to salvage the fragile vessel. From a boat like this Peter, James and John fished for a livelihood. Jesus taught crowds on the shore from such a vessel, and used a similar boat for retreat when ministry led to exhaustion. “Peace! Be still” rings in my ears when I see this first-century hull. A scale model at Ginosar suggests that the craft had a deck under which Jesus could have crawled to sleep. Much as I like to associate this boat with the peace that Jesus brings to stormy seas, it is more likely that the vessel was witness to bloodbath. During the Jewish Revolt of AD 66–70, the city Magdala was one of the last strongholds against Rome in the north. The red arrow shows the likely route of Jesus and the disciples when he calmed the storm in Mark 4. 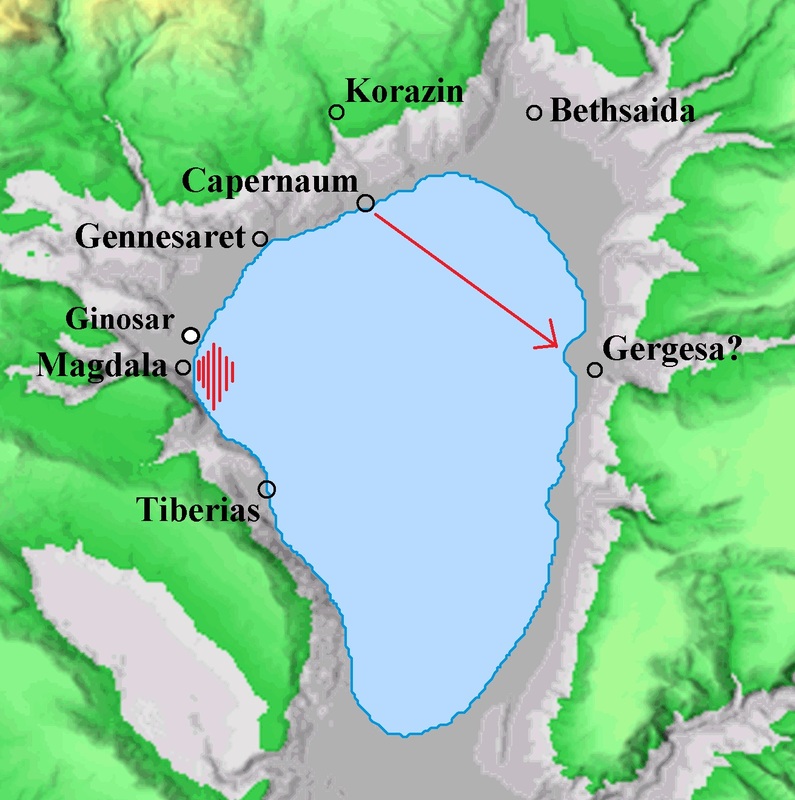 Most of Jesus’ ministry, as recorded in the Gospels, occurred on the north edge of the Sea–between Gennesaret and Bethsaida. The naval battle of AD 67 took place in the red zone immediately east of Magdala (Migdal)–where archeologists found the ancient boat. Prevented from attacking Magdala by land because of its city wall, the Tenth Legion of the Roman army approached by sea. First-century historian Josephus reports that a lopsided sea battle ensued, and many Jews soon were in the water. If they lifted their heads up above the water, they were killed by darts or caught by the Romans. If they attempted to swim to their enemies, the Romans “cut off either their heads or their hands.” The sea turned crimson. The following day there was “a terrible stink, and a very sad sight.” Some 6500 had died in the battle; shipwrecks and bloated corpses littered the shoreline. The Romans executed 1200 prisoners of war at nearby Tiberias, sent 6000 as slaves for Nero’s building projects in Greece, and consigned tens of thousands more to slavery. Although Jesus calmed the Sea of Galilee a generation before the Jewish Revolt, the four Gospels were written during or soon after that conflict. In that charged environment, accounts of Jesus in the Gospels must have had both spiritual and political overtones. Followers of Jesus may have understood his “Peace! Be still!” command as addressing both the violence of a windstorm on the Sea of Galilee and violence of war that filled its waters with blood. Jesus, who calmed violent weather, called his followers to receive and to practice peace even in the winds of war. The black stairway and open doorway to the right of the tree lead to the “Upper Room” (Cenacle). Foundations of this medieval building may be those of an ancient Christian-Jewish synagogue. Jostling along with a stream of pilgrims, I make my way up stone steps to the upper room (Cenacle) in Old Jerusalem. I love this echoing place with its ancient arches and mysterious light. A band of Asian Christians enters and gathers to pray. Their leader sweeps around the circle, laying hands on each pilgrim. Upon receiving this blessing, a young woman bursts into pulsating, full-throated praise in tongues. Others in the room fall silent. Two thousand years ago, mighty wind and tongues of fire filled the upper room. Now tongues again proclaim God’s grandeur! Asian pilgrims pray in a circle in the Upper Room. The man in blue is laying hands on the young woman who spoke vibrantly in tongues. I wish this were the actual upper room where Jesus said, “This is my body, broken for you,” where the risen Christ showed his hands and side, where Pentecost fire came down. But Roman conquerors turned that structure and most of Jerusalem into rubble in AD 70. 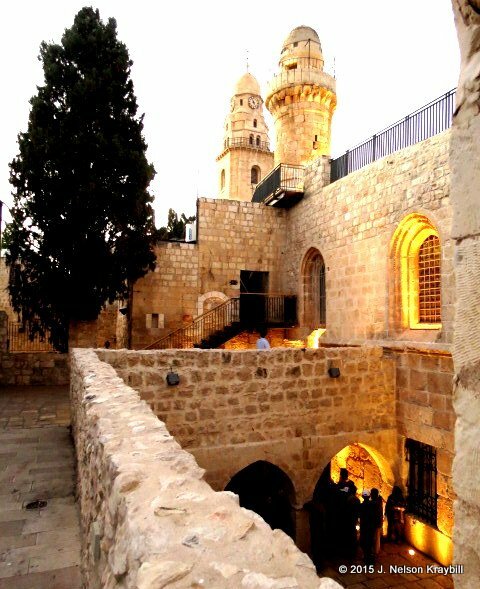 What pilgrims visit today is a medieval hall built on the foundation of an ancient synagogue that may have been constructed on the site of the original upper room. The Holy Spirit in Acts 2 does not reverse the scrambling of languages that happened at the tower of Babel. Rather, the Spirit validates the vast cultural and linguistic diversity of the human family. 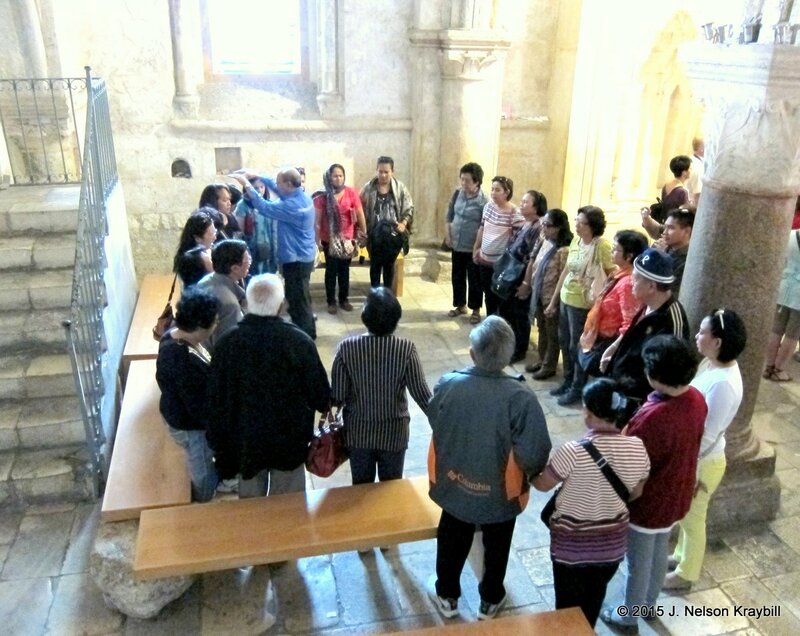 Visitors to Jerusalem from “every nation under heaven” hear the gospel message in their own native tongue. These include pilgrims from Parthia, Media, Mesopotamia, Judea, Cappadocia, Pontus, Asia, Phrygia, Pamphylia, Egypt, Libya, Rome, Crete and Arabia (2:9–11). From here or from near this spot, Jewish pilgrims went back to far-flung homelands reporting that, among followers of Jesus, the prophecy of Joel is fulfilled: “In the last days . . . I will pour out my Spirit upon all flesh” (2:17). The Holy Spirit makes peace by transcending every barrier of language and ethnicity to create one humanity in Jesus Christ.